I always spend the week after a vacation wondering why on Earth we even take a break; it's so much harder to get back into a routine and it makes things more stressful. We seem to be much happier taking a random day off here and there rather than a whole week all at once. We took the last week off from doing any schoolwork and this week it has been torture to get my boys to get to work. Luckily with all the learning we do through play we can still find fun ways to make sure those lessons are getting done. I finally got Ian all set up on the computer playing Kahn Academy and suggested that Alec play with our new colored tiles for a bit. Evan and I read Lots of Spots together. He did great with this new book and found it much easier than P is for Pancake. Once he was done reading I took a new puzzle out for him to play with. I had and wrote sight words on each of the puzzle piece and again on the puzzle board so all he had to do was match the sight words to put the puzzle together. I thought it would be a fun way for him to practice sight words since all my boys enjoy puzzles. It ended up being a reading and geography practice in one. He pointed out many of the landmarks pictured on the map and told me what country they were found in. By the time he was finishing up Alec had joined him. They also pulled out our new United States map puzzle and put that together too. The boys were all talking about playing The Scrambled States of America game and I had Ian set it up while Alec and I worked on the computer. Alec also worked on Kahn Academy and practiced telling time, adding three digit numbers with regrouping (which he easily did in his head! ), some work with area, and identifying fractions. After the game, Evan chose to work on the computer after the game ended and we played on ABCya matching upper case and lower case letters and practicing addition. While he was working on the computer his two older brothers were writing. Ian chose to copy a Shel Silverstein poem while Alec wanted to work on his cursive and practiced the letters L and M.
We read another two chapters in Harry Potter and we're only three chapters away from finishing so it's getting really good now! 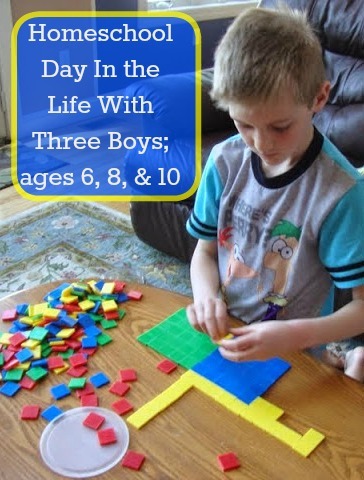 While I read Ian played with the math tiles I had put out on the table this morning. He made a town with a lake, forest and city. During lunch we watched Modern Marvels Architectural Wonders The Great Wall of China and learned so much! It was not revered by Chinese until the Western world "discovered" it and started revering it themselves. We learned about the horrible conditions of workers over the various years and the forced labor of many Chinese. The movie was a bit to historical and dry for Evan, who chose to go and play instead but Alec (who's quite obsessed with learning about China and Japan) and Ian (who loves anything having to do with tools and building) were both glued to the movie. I was impressed with their attention! I declared school "done" for the day and sent the boys outside to play. They spent the afternoon riding bikes and scooters and paying Harry Potter/ Percy Jackson and other assorted games. They found a bird's nest in the road and brought it over to show me. They examined it to see what it was made out of, what size it was and what kind of bird might have used it. We talked about how birds keep their nests in the trees and Alec decided to find a branch to put it back onto in case another bird would like to use it one day. They played on our zip line a bit and then it was time to head out. Their second day of their Lego class went beautifully. They had a great time and we were the last ones to leave. Evan excitedly showed off his Grover (really it was a rover but he kept calling it a Grover and after a bit I decided it was just too cute to "fix"). The boys were quite reluctant to leave and talked animatedly about all that they had built and done. We found that the teacher was also homeschooled and the boys thought that was just great.